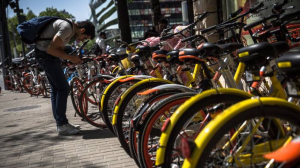 Meituan-Dianping has snapped up China’s top bike-sharing company in a deal that brings together two of the country’s biggest start-ups, both of which are backed by technology group Tencent. The deal, which gives Mobike an enterprise value of about $3.7bn, according to media reports, highlights the empire-building under way in China as the country’s two tech titans — Tencent and Alibaba, together worth more than $1tn — expand their reach across the corporate landscape. Alibaba this week took full control of Ele.me, which has a narrow lead over Meituan in food delivery, and also backs Mobike competitor ofo. Both Alibaba and Tencent are ploughing money into these businesses to lure customers who they hope will in turn use other company services such as payments and shopping. Meituan, China’s biggest online services company which combines food delivery with other online-to-offline services and recently moved into ride-hailing, was valued at $30bn in its latest funding round last year. That makes it the world’s fourth-biggest unicorn, a private company valued at $1bn, according to CBInsights.